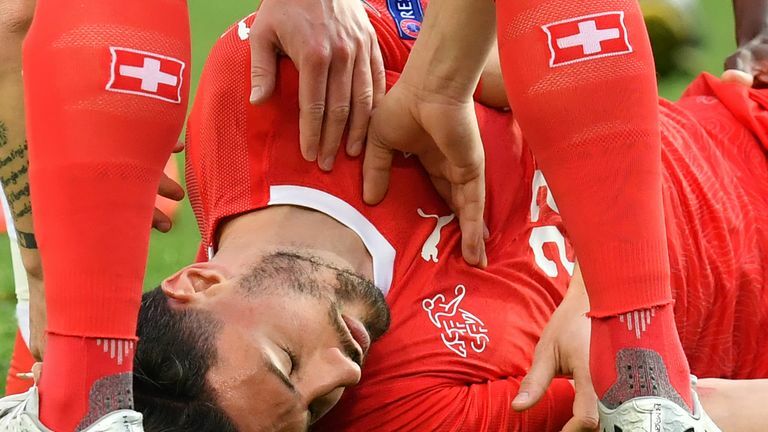 Newcastle defender Fabian Schar says he was unable to "remember anything" after suffering a clash of heads in Switzerland's European Qualifier against Georgia. Schar collided with Georgia defender Jemal Tabidze in the first half of Saturday's European Qualifier, which Switzerland won 2-0, and was left motionless on the ground. Georgia's Jano Ananidze reacted quickly, reaching into Schar's mouth to avoid the 27-year-old choking on his own tongue. Schar played the rest of the game, but it is not yet known if he will feature in Switzerland's next European Qualifier against Denmark on Tuesday. Newcastle are already without the suspended defender for the club's Premier League game Arsenal on Monday April 1, live on Sky Sports. Brain injury charity Headway has called for a UEFA investigation after Schar was allowed to play on. A statement from Headway on Monday said: "The charity has demanded UEFA launches an investigation into the circumstances that resulted in Swiss player Fabian Schar being cleared to continue playing in a match against Georgia - just minutes after being knocked unconscious and needing emergency help from a member of the opposition." Headway chief executive Peter McCabe added: "What is it going to take to make football take concussion seriously?"